People’s Review weekly had already reported on ongoing American efforts to bring Nepal under the US trap. In previous editions, the Weekly had reported that how the US had planned to bring PM KP Sharma Oli under the US trap. Finally, in his congratulatory message to PM Oli on the occasion of completion of one year in office, Michael Richard Pompeo, United States Secretary of State, has urged for working partnership. 2. Nepal’s support to the US on sanctions against North Korea. According to a report by The Kathmandu Post journalist Anil Giri, Prompeo has recalled his meeting with Nepal’s foreign minster Pradeep Gyawali in the United States in the second week of December, where, Gyawali had reassured him that the government will continue to protect the rights of the Tibetan refugees sheltered in the country. 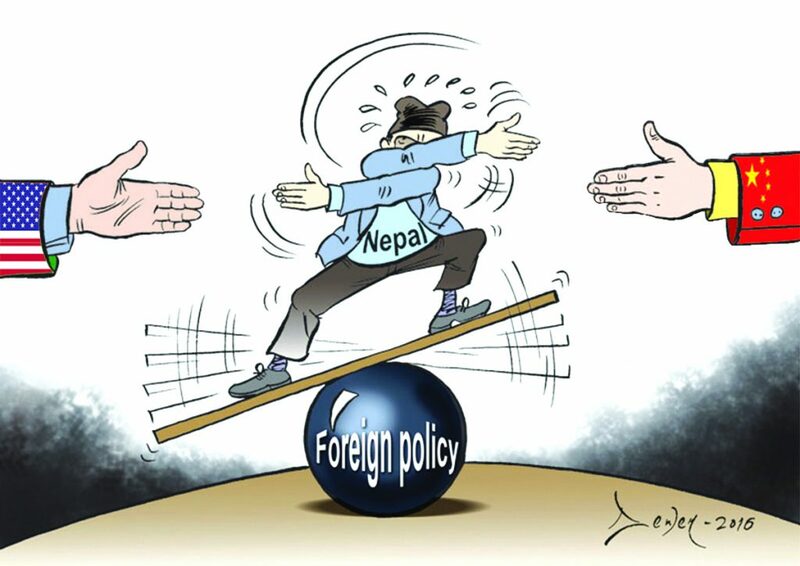 Prompeo’s message is enough to understand that the US doesn’t want Nepal’s partnership with China, particularly on BRI. The above are the main conditions to receive 500 million US dollar support under the Millennium Challenge Corporation already announced by the US. Earlier, this Weekly had reported that if Nepal will deny to join the Indo-Pacific Strategy aimed at encircling China, she will not only be disqualified from any kind of support from the US, but also, the Oli led government would face political crisis in the near future. Sources claim that the American embassy had strongly opposed installation of the computer networking software developed by Chinese company, Huawei Telecom in the war room at the PMO and computer networking in the cabinet ministers’ secretariat. Later, the government was compelled to cancel the agreement with the Huawei company and rewarding the company recommended by the Americans. Drishti vernacular weekly, known to be closed to PM Oli, has reported that the government has been horrified from the American human rights report. The report has stated very poor state of human rights in Nepal. This report can be linked with the joint statement of the Western ambassadors in Kathmandu in the recent past. The Western ambassadors had asked the government to clarify Nepal’s stand on the transitional period justice. According to a highly placed source, the joint statement was aimed at horrifying the government, the then Maoist and the Nepal Army who were involved in the so-called people’s war. The source claimed that already, the court is under the Western influence and by using the court, the West plans to avow the human right violation cases during the “people’s war” period. China is the immediate neighbor of Nepal. Nepal firmly stands on “one China policy” and accepts Tibet as the internal part of China. Whether PM Oli wants to develop partnership with the US by annoying China, a trustworthy and friendly neighbor, it will become clear in the near future.